I'm a modern rock lover right out on my fingertips and I love a lot of guitars with melodic hooks, not too slow. If I'm gonna like slower ones [they've] got to be really good. And here we have one of those moments. 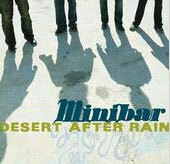 This one, Minibar, is a record that I have played over and over and it's getting better and better the more I play it. Like a British version of Neal Casal or like Travis with 60's influences, slow, melodic and with very high standard on all the songs on the album. Just listen to "Sheer Volume of Traffic" or "Lost in the Details" and you will understand. British Midwest rock at it's best.